I love handmade gifts, and try to give them as often as possible. It’s not always realistic, depending on the season and what we have going on at home, but when I can, I always try to add a little something handmade to a gift–especially for a baby. Last month I went to a shower for Matt’s cousin, who has her first baby–a little boy–due next month. For this new little cousin arriving in January, I made a set of burp cloths. Burp cloths are one of my very favorite baby gifts–they’re practical and also pretty (or handsome, in this case). Since you have to use burp cloths ALL THE TIME with an infant, I feel like they may as well be cute. And these are simple to make–anyone who can sew a straight line can do it. 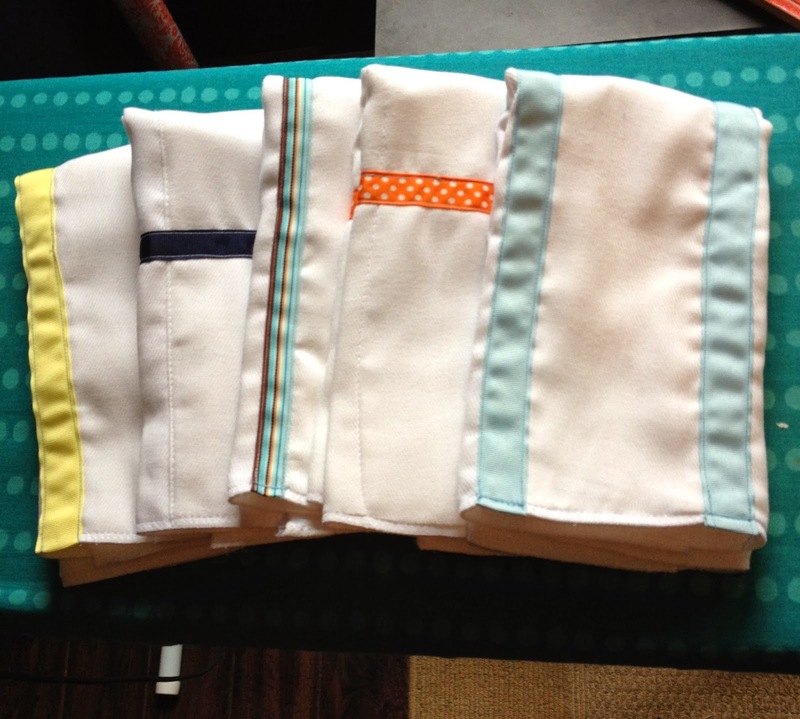 To make a set of burp cloths, you need a pack of cloth diapers, grosgrain ribbon (in a few colors or patterns), and a sewing machine. That’s it. I like to use the 100% cotton, tri-fold diapers for this project–it takes away the need to measure, as I just have to line ribbon up on the folds in the diaper. I don’t even measure the ribbon, either–just lay it along the diaper, cut the appropriate length, and use that first cut to measure out the rest of the ribbon pieces. Easy peasy. I always, always, always iron the ribbons and the diapers before I pin and sew–you need to get the wrinkles out so the ribbon lays flat and is easier to stitch down. Then pin the ribbons to the diaper–just one line of pins down the center of the ribbon is enough to hold it in place. I fold the ends of the ribbon under, iron them flat, and pin them down that way–you don’t want an unfinished edge of ribbon because it can unravel. Then just sew up one side of the ribbon and down the other. So simple! For this little set, I did do some ribbons horizontally across the diaper instead of vertically along the fold, but just because I really wanted to use the orange polka dot ribbon and I didn’t have enough to do the long length of a diaper. It requires some actual measuring that way since you need to space the ribbons out evenly without the help of the pre-existing diaper folds, but it’s still pretty simple. I am always looking for simple and cute craft projects I can use to add a handmade touch to a gift. What are your favorites? This entry was posted in Crafting, Gifts on December 11, 2013 by Little Nesting Doll.